Shred Like Wolverine With the August M&F! 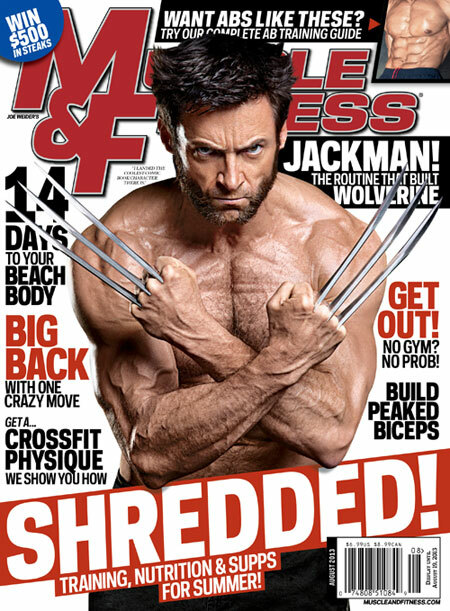 13 years as Wolverine and Hugh Jackman is still shredded. Learn his secrets. X-Men superhero Wolverine is known for his mutant healing abilities, his indestructible adamantium-coated claws, and his badass attitude, so it's only fair that his razor-sharp persona comes with a shredded physique to match. It wasn't easy for Australian actor Hugh Jackman to step into the role. He was the self-admitted "before model" before he went on a strict training and nutrition regimen to become a hero--a role he's inhabited now for 13 years. How did he do it? M&F talked to him and his trainer to find out. Plus, M&F's NEW and improsived food pyramid for your bodybuilding goals, outdoor training, the 14-day beach body workout, unconventional six-pack moves, the true story behind the performance-enhancing drug witchhunt, and all the awesome training, nutrition, and supplement information that makes Muscle & Fitness your definitive guide to fitness. Ready to shred like Wolverine? Prove it! Grab your copy today, M&Fers, and tear up your next workout.